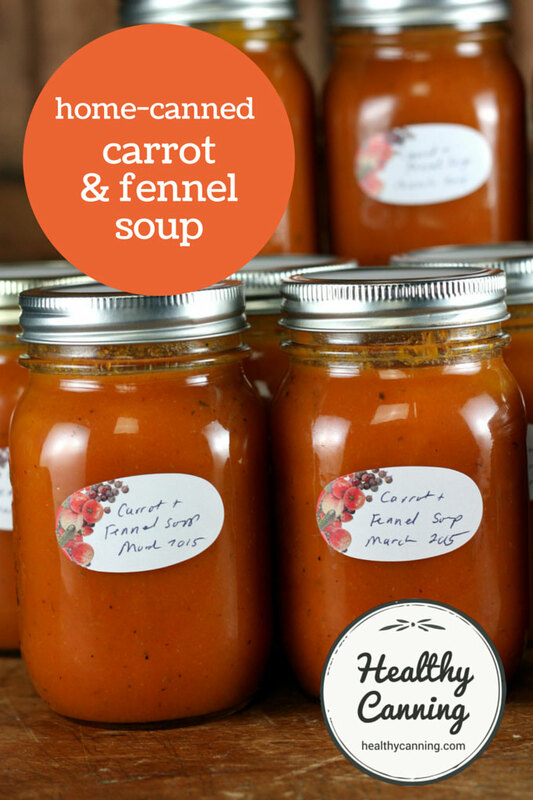 This is a delicious, creamy-tasting carrot soup recipe for home-canning from Ball. 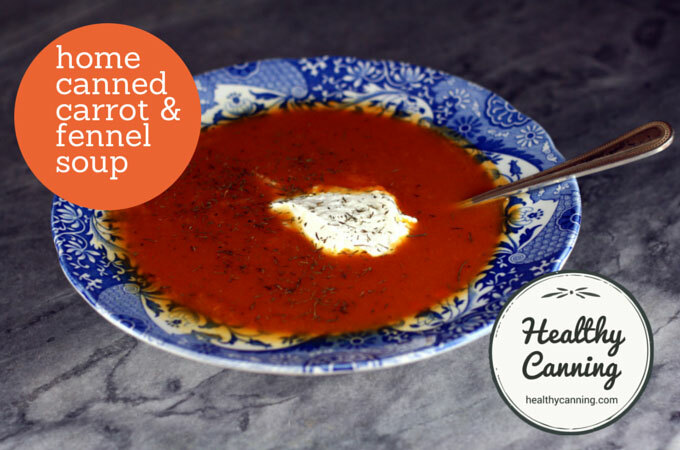 Try serving with a dollop of fat-free Greek yoghurt or fat-free sour cream on top, with a drizzle of maple syrup. Or when you open a jar to heat, mix it first with a few tablespoons of SOS mix to turn it into a Cream of Carrot soup. The fennel taste does not come through strongly at all here. NOTE: As of 2018, Ball has increased the processing times for this recipe. The processing times on this page reflect those changed updated times. If you wish to double the batch, do the math first on paper. 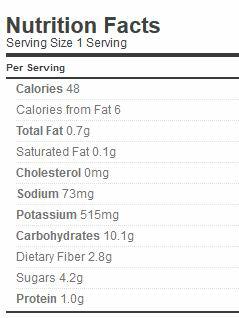 The sodium is 654 mg per cup, but you can reduce that to 73 mg by using a salt sub or omitting. 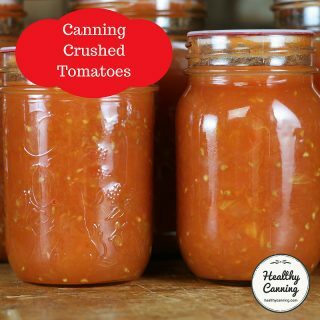 While the soup must be canned in a pressure canner, to prepare it for canning you can use either a regular pot or a pressure cooker. 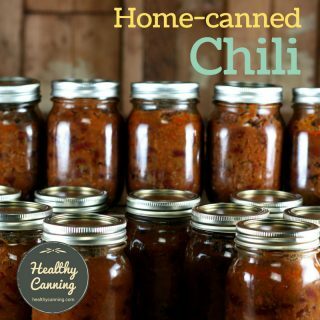 To preserve it: if you don’t have a pressure canner to can it, you can freeze this. You cannot water bath this. Wash carrots. Peel, wash again, slice and set aside. Let the mixture cool a bit until it is safe to work with. Put mixture back in pot. Add the remaining 2 litres (8 cups / 64 oz ) of stock. Bring back to a boil, simmer on low for 20 to 30 minutes. Adjust flavouring with some or all of the suggested flavourings above. 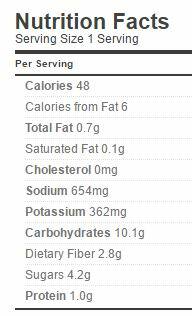 The recipe called for 2 tablespoons of salt up until 2016, then they changed it “to taste.” We left it at 2 tablespoons, for the sake of honesty (that is at least how much people would add.) Feel free to adjust: it’s not here for safety, just taste. You do not need pickling salt in this, any salt is fine. You can omit. Or, instead of the salt, you can use a non-bitter, non-clouding salt sub. We have found Herbamare Sodium-Free performs well in that regard. 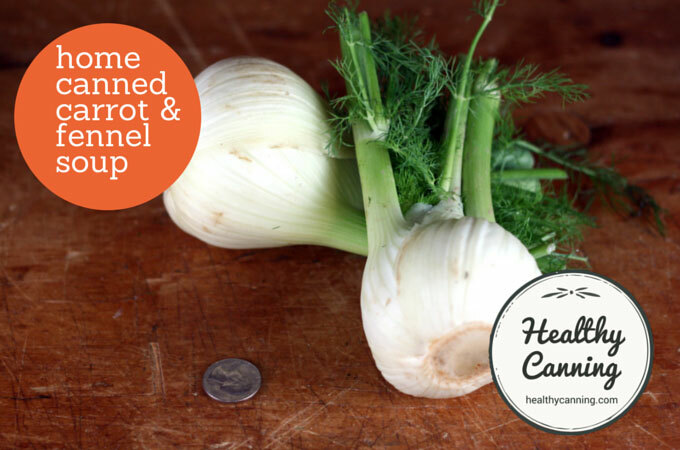 You can use less even fennel, if you want to lessen the fennel taste. You could even safely omit it, or use the same amount of celery. The lemon juice can be fresh or bottled. It has no preservative effect here; the acid in it is just to wake up the flavour. Instead of lemon juice, you could use Maggi or Worcestershire sauce. 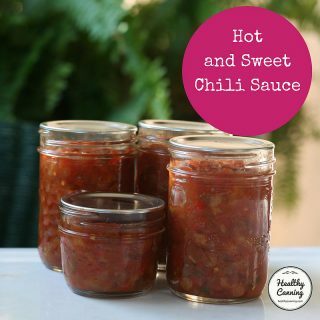 If you think it needs something to round out the flavour, try adding a few tablespoons of white or brown sugar, or 1/2 teaspoon liquid stevia, or a few tablespoons of maple syrup. The carrots must be peeled to reduce the bacterial load going into the canner. 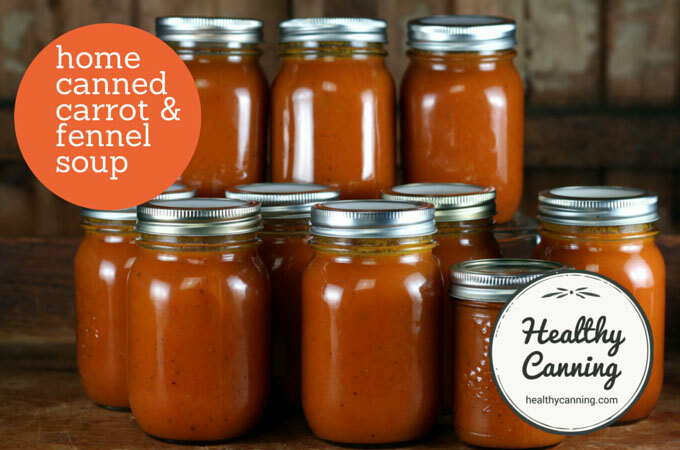 Instead of peeling carrots, you can use frozen, or, home-canned carrots that you drain (tip! use the drain water as part of your vegetable stock for this soup). 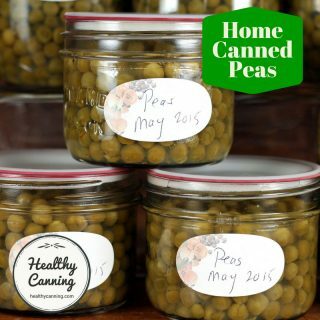 Just weigh out the frozen or drained, home-canned that you need. For frozen, follow the same cooking times as for fresh given here. The danger in putting a piping hot mixture in a blender is that it could surge up out of the blender, forcing the top off and scalding you. Letting the mixture cool a bit, and holding the top down with a cloth to prevent hot mixture escaping, usually does the trick. 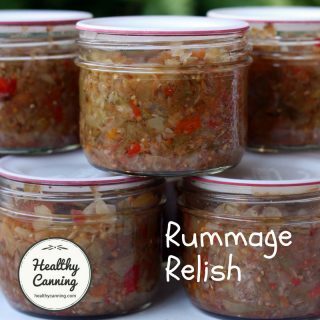 If you double the batch and can’t fit all the jars in your pressure canner(s) at one go, then refrigerate the rest until you do. Then reheat to piping hot, and proceed with canning directions. 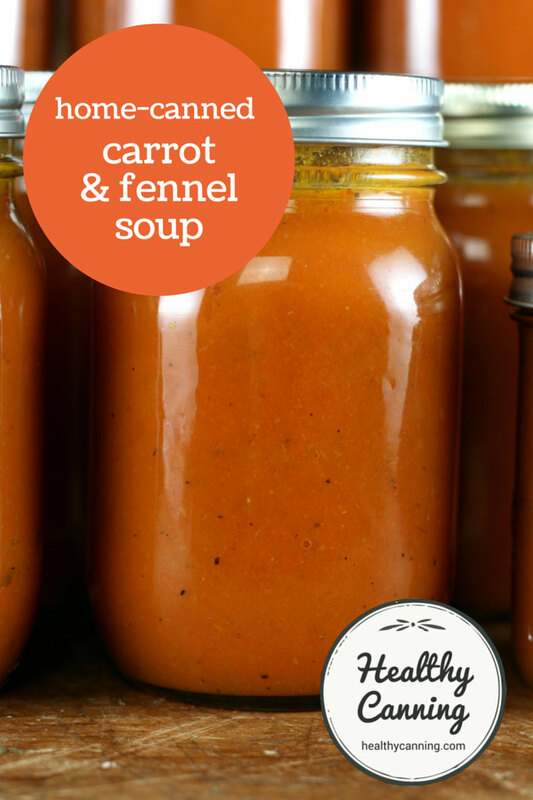 Savoury Carrot Fennel Soup. Ball Fresh Preserving site. Accessed July 2015. 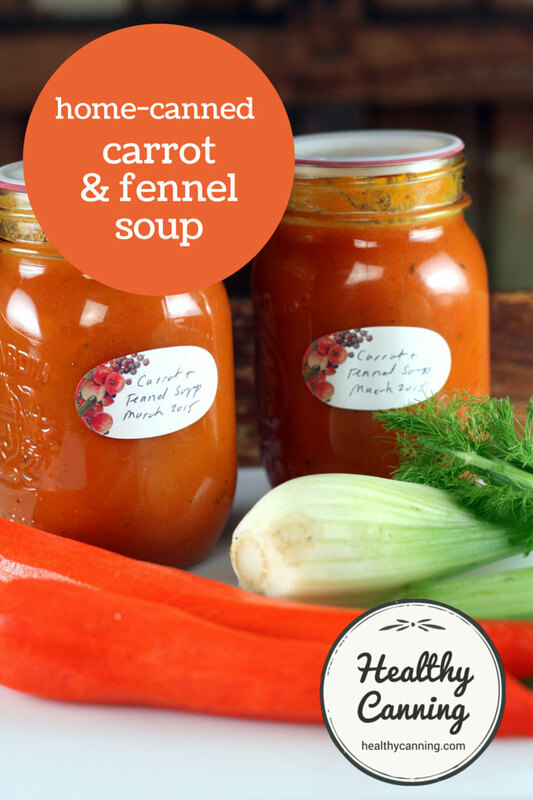 Also available in a version not for canning: Savoury Carrot-Fennel Soup. Ball Blue Book. Muncie, Indiana: Healthmark LLC / Jarden Home Brands. Edition 37. 2014. Page 173. Used all stock instead of half stock / half water. 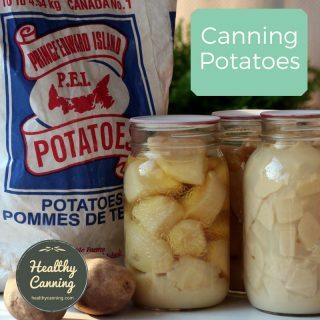 As of January 2018, this canning recipe has yet to appear in print and is only on Ball’s web site. Ball has been slowly upping the processing time recommendation over the years. In 2014, on its web site, Ball called for 35 minutes for both pints and quarts. In 2016, they changed their processing recommendation to 35 minutes for pints, 40 minutes for quarts. By 2018, they had changed the processing recommendation to 40 minutes for pints, 50 minutes for quarts.